Everton boss Roberto Martinez believes John Terry has broken Premier League rules by speaking publicly about Chelsea's pursuit of Toffees defender John Stones. Chelsea captain Terry said recently that Jose Mourinho's side are looking at players like 21-year-old Stones as ones "for the future". Martinez, though, is unhappy that one of his players is being talked about so openly by other clubs. "That is illegal," said Martinez. "The rules don't allow you to comment on players who are registered at other clubs in that open manner. That is disappointing." Premier League rules state that clubs "will respect the contractual obligations and responsibilities of each other's employees and not seek to breach these or to make illegal approaches". Stones, who made 23 Premier League appearances last season, still has four years to run on his current Everton deal. 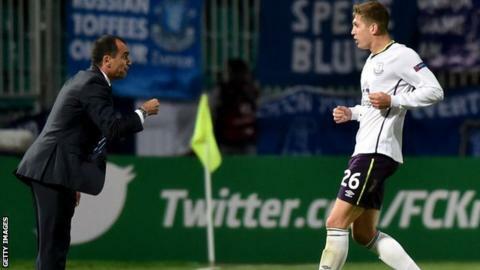 Asked whether the speculation about his future has unsettled Stones, Martinez added: "Yes - and it is something where you hope you learn from it and you get more mature and those experiences are good experiences." At his first weekly news conference of the new season, Mourinho appeared to make a veiled criticism of the Toffees boss. "I'm not speaking about Everton or Stones. I'm just speaking in general," he said. It is not the first time the situation has angered Martinez. The Spaniard criticised Chelsea last month for making their initial interest in England international Stones public. Mourinho confirmed a bid by the Premier League champions had been made, which was reportedly rejected, saying: "We made a bid because we like the player." Martinez responded at the time by saying: "There is the disappointment of a club making a statement to the press and making it openly."